Fantastic Frogs & Terrific Toads! Lessons, Links, Printables, and Ideas to match a Unit or theme on toads/frogs for grades k-3! Compare and Contrast Frogs and Toads! Show your students the word amphibian written on a piece of paper. Share with them that the word amphibian means two lives. Tell them frogs and toads are amphibians because they live part of their life in water as tadpoles and part of their lives on land as frogs and toads. Talk about what frogs and toads look like, how are they alike, and different. Look at pictures to compare them. Make a chart like the one below with your class! Some fun activities to use with a frog unit! Lily Pad Hop - cut lily pads from green construction paper, write a numeral on each one, have the students hop from one to the next in numerical order. Life Cycle Sequence - have the students put pictures of the life cycle of a frog in order and be able to verbalize the stages. Stamp a frog pond picture, have out paper with lily pads and a pond drawn on it have the kids add frogs and toads to the pictures using rubber stamps. Count the number of frogs in everyone's pond. Make some Jell-O (or pudding would work too) for the pond (grape works good!) pour into individual clear plastic cups, on top add some blobs of green whip cream (food coloring added to whip cream) and place gummy frogs on each blob (whip cream is the lily pad) add some flower sprinkles if you have them! Looking for some great ideas to use with the story Frog and Toad? 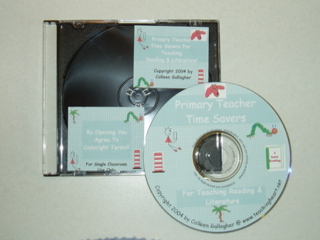 Our Primary Teacher Timesaver CDROM for teaching Literature and Reading is filled with over 10 activities to use with Frog and Toad. You will find tons of other resources for teaching literature and reading. Check out the free samples by clicking here! Activities to Match the Books Above! Who wanted to change to a frog. Did you know frogs grow and change? Uh-huh, uh-huh. A tadpole is a baby frog. It moves its tail to swim along. Now we know frogs grow and change. Uh-huh, uh-huh. Its back legs are the first to grow, Uh-huh, uh-huh. Then its front legs start to show. Uh-huh, uh-huh. It climbs onto the land that's near, now its tail can disappear. The frog's back legs grow big and strong, Uh-huh, uh-huh. It uses them to hop along. Uh-huh, uh-huh. Eating the MOST delicious bugs, yum, yum! Then there were four freckled frogs! Then there were NO freckled frogs! Little Tadpole - Sung to "Frere Jacques"